Let's have a look at those kill mechanisms, with the help of our army of cuprous oxide warriors. Chemical elements, such as copper, are atoms made up of a stable nucleus and a less-stable cloud of electrons. 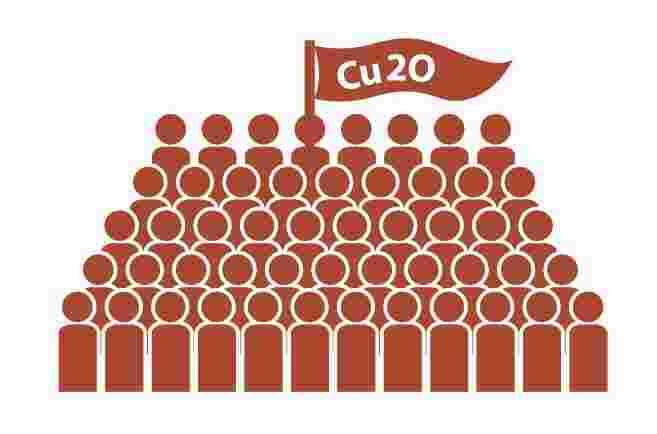 When copper oxidizes, or loses electrons, it creates an "oxide" of itself, what is called cuprous oxide (Cu2O). In this form, the redox binds copper atoms to oxygen atoms, which are then in a state of constant exchange of electrons. This makes cuprous oxide unstable enough to disrupt organisms at a microscopic level - the perfect army against microorganisms that cause illness and disease. Copper, through cuprous oxide, kills these germs through three main pathways, with five total kill mechanisms available at any time it comes into contact with cells. Any of these five kill methods can destroy bacteria, but overlapping mechanisms can also prevent developing resistance. So what are these five kill mechanisms? Copper is a metal. When metal reacts with water - either in liquid form or through air moisture - it oxidizes. We call this "rusting" when it applies to metals. The first kill mechanism is this rusting, when the process of creating rust molecules, copper pulls electrons from the membrane of the bacteria’s cell wall lipids, oxygen or proteins. Oxidizing copper atoms weaken the bacteria when they pull these electrons from the atoms that make up the cell wall. 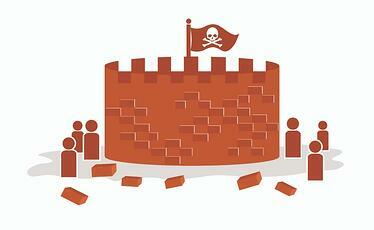 Just like pulling bricks from a wall, eventually the cell wall breaks, killing the bacteria. Three kill mechanisms have to do with microbial cellular toxicity. As the oxidizing copper atoms break down the cell wall, the bacteria attempts to adapt to the environment by taking in from its surroundings or pushing unneeded elements out. As a result, the copper ions flood into the cell. Copper is quickly toxic to the inside of the cell, which is full of fragile, DNA-making parts. The three mechanisms involve different aspects of these internal mechanisms, from energy production to DNA-writing. 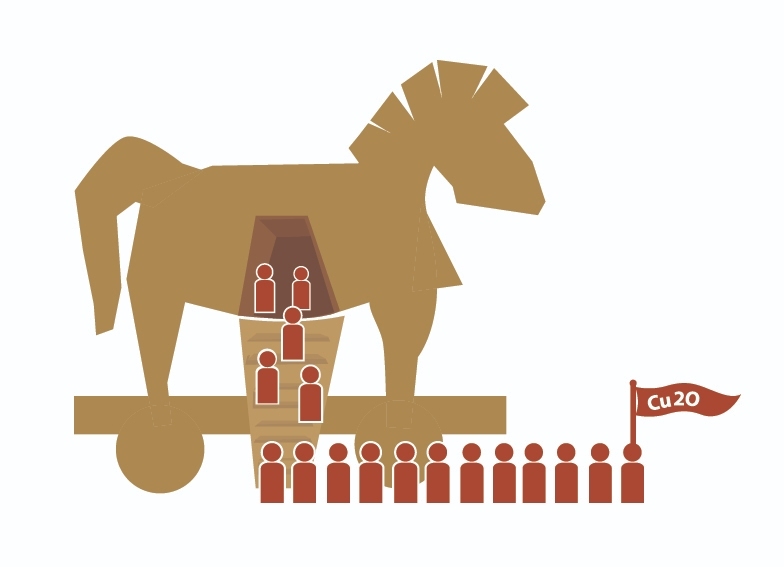 This mechanism is like the story of the Trojan Horse. Outside, the army was working hard to break down the wall. But once the army found a way inside, it quickly destroys the inhabitants. The army has many mechanisms for destroying the enemy: Stop supplies of food (cell energy), disrupt communications (DNA-writing), or destroy weapons and supplies (displacement flooding). The third category and fifth kill mechanism is through the pathway of free radicals. Oxidizing copper releases free radicals, atoms of oxygen and hydrogen or oxygen hydroxide. 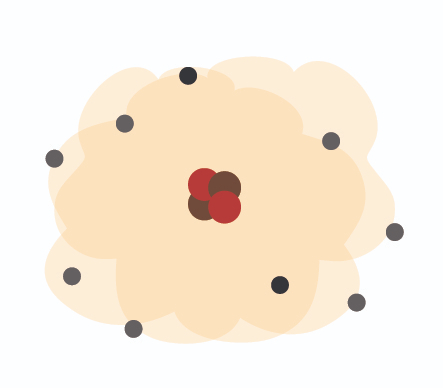 These atoms are highly reactive with other substances because they have one or more unpaired electrons; this makes the atoms unstable. 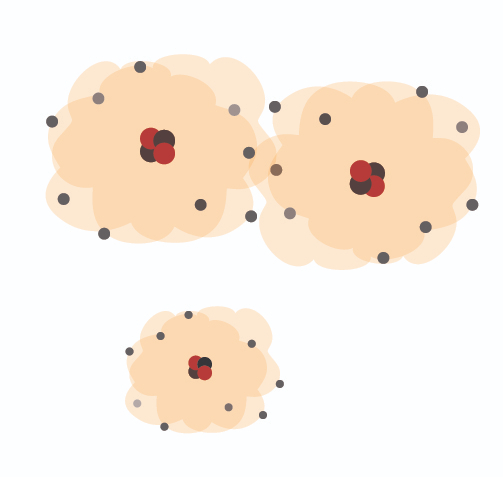 All atoms want to be stable and so they seek out an electron to make a stable pair. As a result, they "steal" an electron from surrounding molecules, setting off a destructive chain reaction in the bacteria's cell membrane, rupturing it and ultimately killing the bacteria. Imagine a meteorite hitting the Earth, destroying swaths of land as it comes crashing through. While it eventually stops, it leaves a deathly wake. In our case, the fatalities are harmful bacteria and other germs. So basically, the act of rusting makes copper a very inhospitable place for microorganisms. Just the kind of surface we want where germs are present. You'll never look at the humble penny in the same way! Now that you know about the antimicrobial properties of copper and the science that explains it, chances are you'll be curious about how innovative technologies are harnessing this power in a practical, aestheic way for today's healtchare environments. You can learn more here. Thanks for stopping by!